Hardy perennial with very striking mauve flowers. Flowers through summer and autumn, growing 1.2m high. The word Echinacea comes from the Greek word for hedgehog, due to the prickly middle of the flower resembling hedgehog spines. Valuable herbal plant, used for many years by the North American Indians who recognised its useful properties in stimulating the immune system and promoting healing. It also has anti-viral and anti-bacterial qualities. 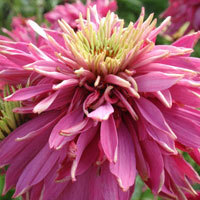 Hardy perennial with very striking mauve flowers. Member of the Sunflower family. Petals are pulled down from the brown conical middle of the flower. Flowers through summer and autumn, growing 1.2 m high. Valuable herbal plant, used for many years by the North American Indians who recognised its useful properties in stimulating the immune system and promoting healing. It also has anti-viral and anti-bacterial qualities. Flowers sprout another set of petals atop the cone, in a most amusing and charming cap. It is as if another set of petals have flown in and perched. Doubles bloom often in their first, but mainly in the second year and thereafter. Flowering Sun Hat also suitable as cut flowers. The average height is 75 cm. the flower color is rose red. The flowering period is July-september. This plant is good Hardy. 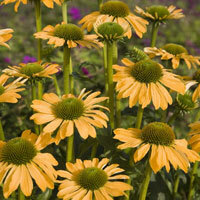 Echinacea 'Harvest Moon' surrounds a rusty-orange center with golden petals tinged with harvest colors. And 'Harvest Moon' holds its color in the worst heat and keeps on blooming. The rose-like fragrance of the Big Sky Series is really unexpected here, in a yellow, daisy-like flower. 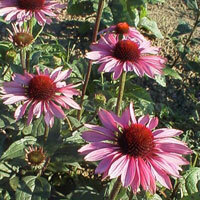 But Echinacea 'Harvest Moon' brings with it all of the Big Sky Series good breeding. 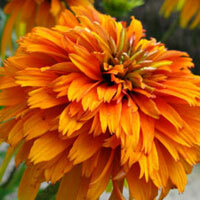 Stunning new Echinacea filled with huge dark orange flowers. Strong plant of about 80 cm height. Stems are sturdy and not easily blown over. Hot Papaya is an asset to your garden. 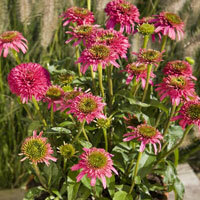 This wonderful new Echinacea is a great addition to any landscape. 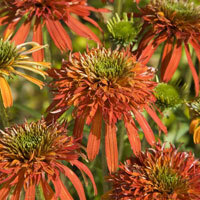 It has not only all the wonderful qualities of other Echinaceas—long blooming, beautiful cut flowers, attractive to bees and butterflies, but it has a wonderful flowering habit as well; the flowers emerge yellow and then darken to red as they mature, leaving a lovely mix of flower colors on each plant! Echinacea ‘Hot Summer’ will grow to about 80cm tall. .
With colors like rainbow sherbet, these fragrant, 3,5 cm blossoms first emerge pastel yellow with a large copper cone, then quickly develop into double, coral pink flowers with a slightly deeper pink pom-pom on top .It’s a kaleidoscope of delicious colors that are sure to add a unique element to fresh flower bouquets. A beautiful profusion of flowers with dark purple petals and an orange central disk. An excellent cut flower or border perennial. 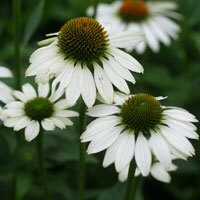 Echinacea is a fantastic flower for attracting insects into the garden such as bees. 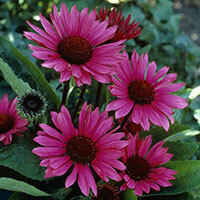 The Echinacea ‘Little Magnus’ is a dwarf variety of the widely grown and very hardy coneflower ´Magnus´. This is the lowest growing echninacea. But don´t let it´s small stature fool you… the blooms are the still measuring about 8 cm across. Plants are very compact and tuck in nicely with other perennials. This plant is an easy to grow flower that produces beautiful deep-purple daisy-like flowers, a bit larger than the rest of its family. It was Perennial Plant of the Year in 1998. It is a major attractor to butterflies and bees and deer resistant. A new intersection and has a light orange-filled flower. This color is not that much, so quite a complement. Plant is also quite strong with about 75 cm. Remain firm and steal his beautiful upright. 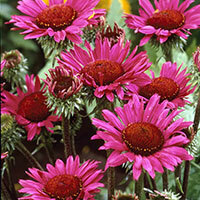 This sun tolerant, special short variety is very compact and has a long blooming time. The cone turns into a red-brown pineapple shape that keeps his elegance through the winter. 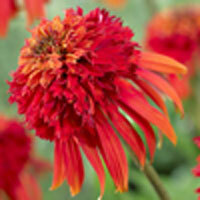 High Orange echinacea, fairly new not verbloeiende selection. Does not like wet feet in winter. Combines great with grasses. Specifies the border a sunny key. 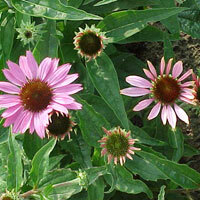 Short double pink Echinacea for pot culture. Steal are sturdy enough and remain perfectly upright. Height approximately 40 cm. Flowering from June to September. 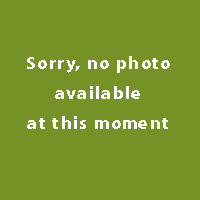 Is Plant Breeders Rights. 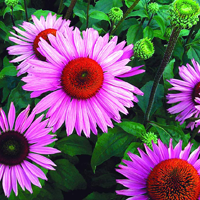 The orginal double Coneflower, ‘Razzmatazz’ produces fragrant purple-pink flowers formed with a large pompom center set on a base of longer petals. 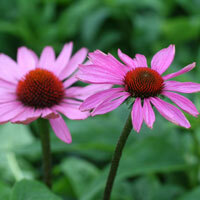 Across the stream of new Echinacea’s still something new! Flower is just starting and will fill up completely. Height is approximately 80 cm. Flowering July to September. Is Plant Breeders Rights. This plant has absolutely huge blooms measuring 18 cm across. The ruby-pink blooms are high above lush mounds of dark green foliage. Plants have very sturdy stems and carry multiple flowers. The Summer Breeze has a very branched habit. It has sturdy flower steals. Te perennial is suitable for growing in a pot. Loves full sun. Sturdy branched plant with a unique ability to create always new flowers. The Flowers keep discolouring from yellow/orange into old pink. Beautyful yellow Echinacea. Strong plant that grows well. Nice round flowers with green center. Is Plant Breeders Rights. Has double orange flowers on sturdy steal. Is Plant Breeders Rights. Aremarkable hybrid Coneflower in a unique designer colour. Plants are strong and bushy in habit, ideal for sunny borders and growing in mixed containers. Flowers have short-non-drooping petals in a rich shade of deep-purple-red, surrounding a central brown cone. Flowers are very attractive to butterflies. This plant has fragant white petals with a coppery cone. It´s a good cut flower. Coarse deep green 20 cm leaves are serrated ands act as a pleasing companion for smaller plants.